As much as I enjoyed this book, I didn’t know until I was 40% into it that it was a sequel. Totally my fault but I’m surprised how much I liked this book considering I haven’t read the first book. I loved the concept of this book so much. The concept of this book is without a doubt one of the best I’ve ever read. I love pirates so this book was right up my alley and I loved the fantastical creatures in this book as well. 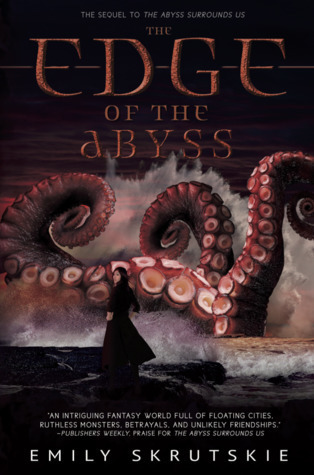 This reminded me of Pirates of the Caribbean, which is one of my favorite film franchises, and if you enjoy PotC, I’d highly recommend this The Edge of the Abyss (but don’t be like me, you should read the first book before reading book two). I was actually pretty invested in Cas and Swift’s relationship and I think their relationship is one of the best written that I’ve ever read about. Overall, I really enjoyed this book and I’m excited to go read the first book. I loved the concept so, so much. If you’re looking for a really exciting and fun LBGTQ fantasy series, I’d definitely recommend The Abyss Surrounds Us series.